Yesterday, my brother mentioned it is almost impossible to find an authentic Philly cheese steak outside of Philadelphia. This is mostly true. 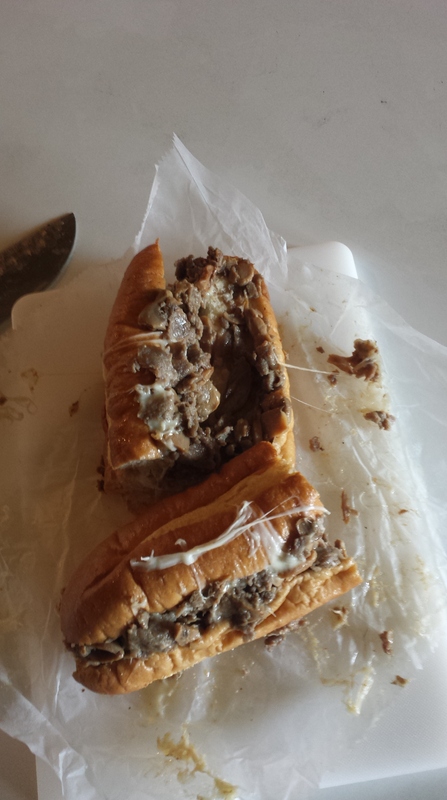 Even in Princeton, which is only 45 minutes away, you can’t get a real cheesesteak. Hoagie Haven (Princeton, NJ) is good, but not authentic. And the winner is … Trattoria Contadina!!!! When you see a 91% urban spoon rating, you know you’re going to be in for a treat. When I’m traveling, it’s 10 or 11 restaurant meals in a row, so I try to keep some variety going. Since I’m outside Pittsburgh, I usually take the opportunity to get better ethnic food than one can typically find in the burgh. That means sampling from the Travel Food Groups: Bar Food (usually Sunday night at the hotel after checking in), Burger (when I get dragged somewhere like Friday’s), Thai food, Chinese food, Seafood, Pasta, Sandwich, Indian food, Pub food, Soup and Salad, Mexican food (southwest only), Local Specialty, and Steak and Potato. Italian food is generally not on my radar. HOLY CRAP IS IT INCREDIBLE. This is one of those dishes I dream of being able to make myself. Everything on the plate was absolutely stunning and perfectly prepared and worked wonderfully together. 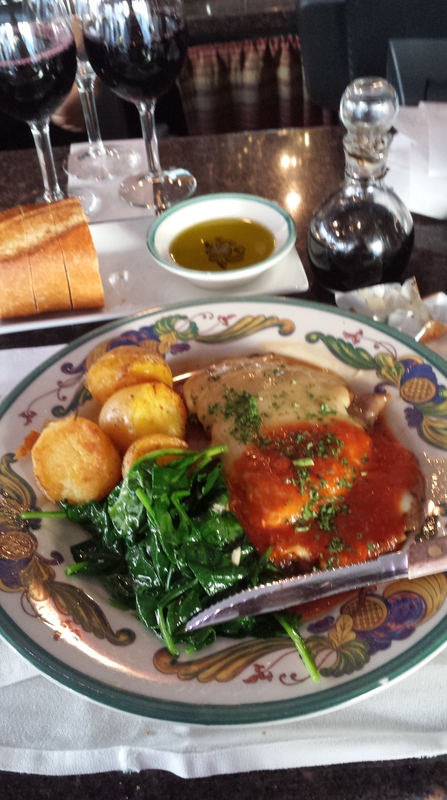 The roasted potatoes and spinach were perfect, and the marsala and tomato sauce were incredible. There was a distinct sweetness, almost like syrup to the sauce that went perfectly with the tender veal scaloppini and mozzarella. And the service was top notch. 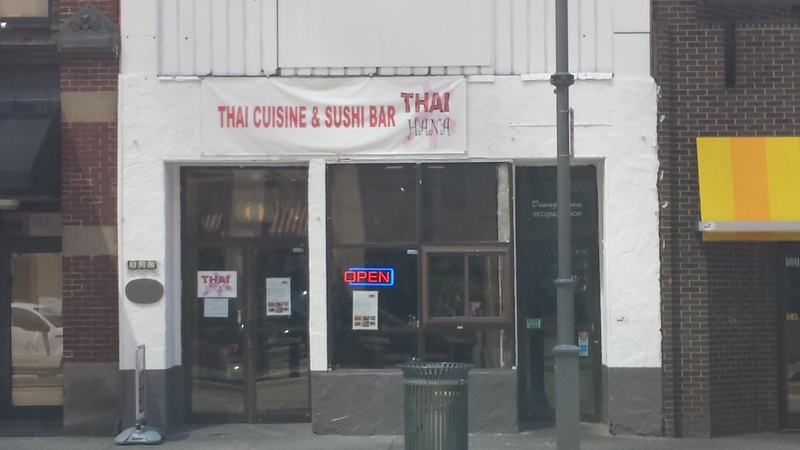 It’s a pretty small place, so I recommend reservations. Since I was alone, I sat at the bar and talked foodie stuff with a very intelligent and friendly bartender. I can’t say enough good things about this place. 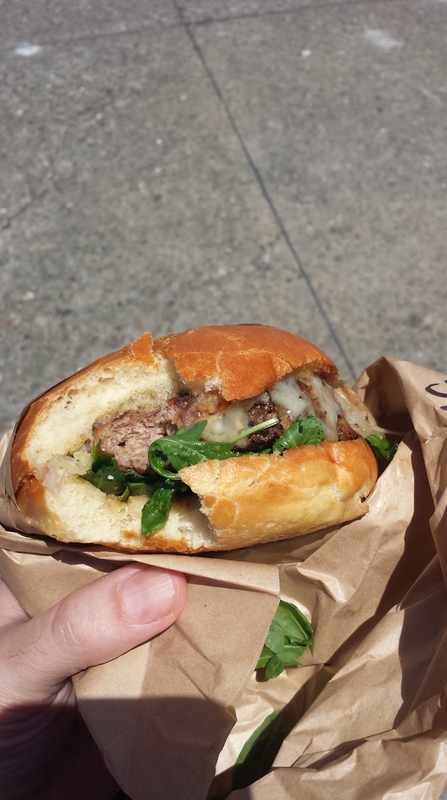 If you’re in San Francisco, you have to try it. Best dish I’ve had so far this year, and that includes my own signature dish. 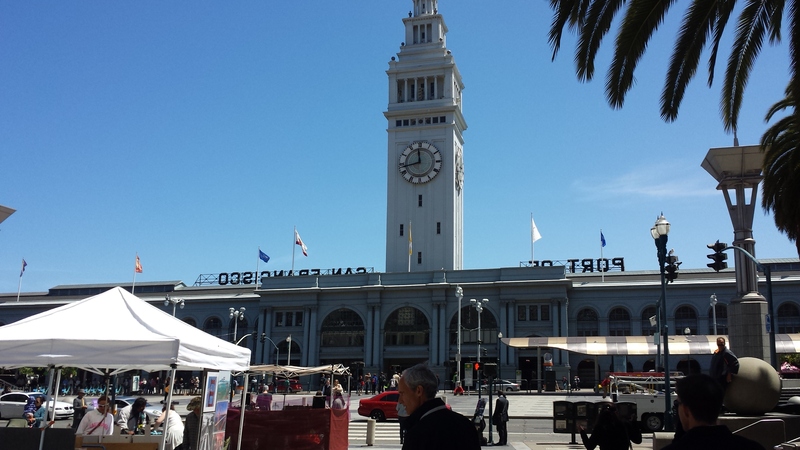 Only two more pictures left from my San Francisco trip! Sorry the picture is a bit dark; like I said, it was taken in a dark dive bar. 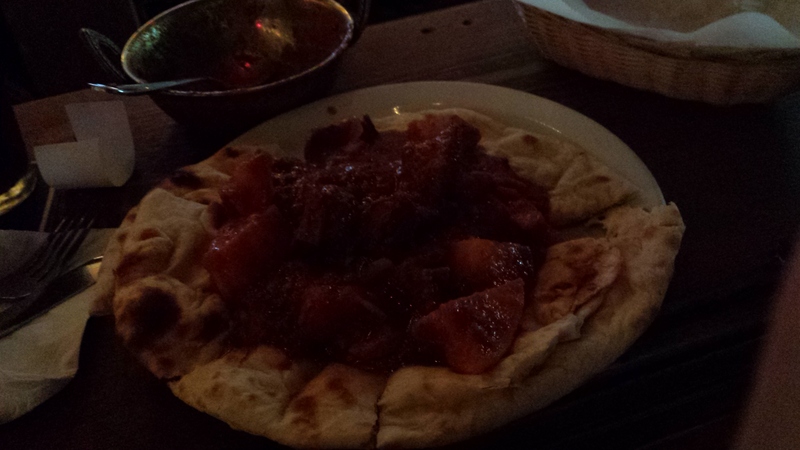 But the service was great and the food was excellent. I walked past it a few times and was intrigued, so I decided to try it and was glad I did. BTW, I used urbanspoon to find most of these restaurants. I use it every time I travel, and have rarely had a bad experience. Awesome dish, nearly perfectly executed. Yes, it has shown up twice recently. It’s one of my favorites. It was pretty good, thought I’m not impressed with the substitution of red cabbage for a more traditional cabbage. 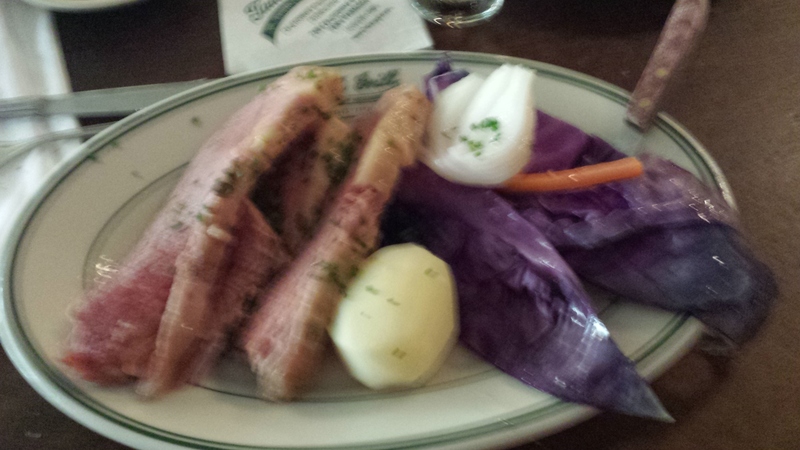 The corned beef and potatoes were excellent, though. It’s another traditional dish that I cook myself quite often, and will probably show up on this blog some time this year. The staff was more interested in watching the world cup than serving customers, but I’ll forgive them because I was the only one there, and the food was awesome. Best chicken satay I’ve ever had (mental note: add that to the list of things to learn to cook). 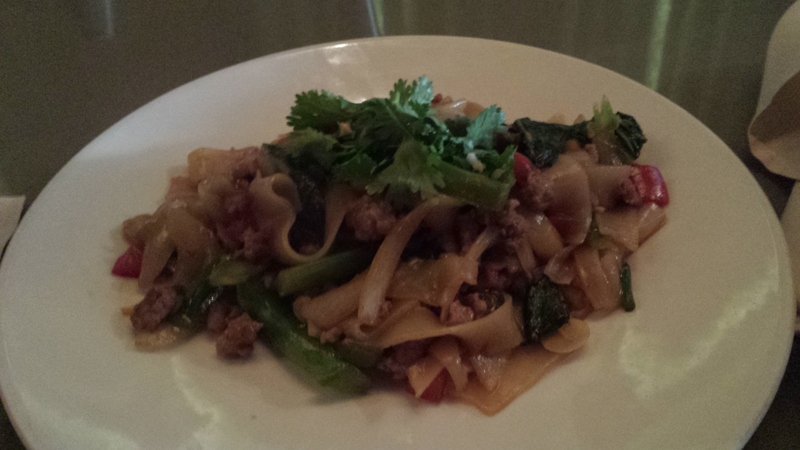 I don’t remember what this is called, but it’s close to Pad Kee Mao, which is my favorite Thai dish. It will probably show up on this blog sooner or later, as I cook it every now and then. In fact, I’m tempted to duplicate this dish plate one weekend, and see if I can outdo it or at least match it. 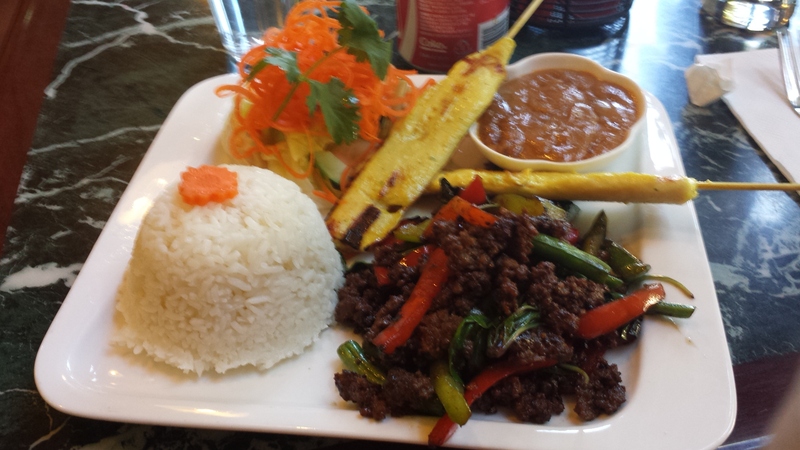 It was wrapped in green onions, and covered with an unusual smoky sauce that was completely foreign to me. 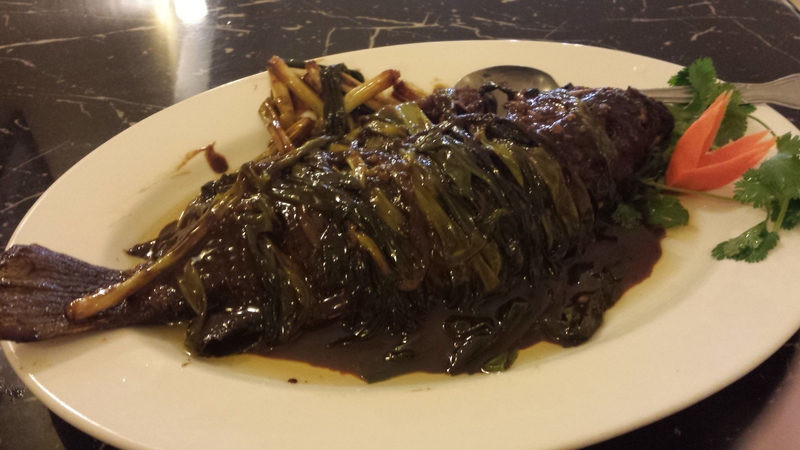 But of course, braised whole fish is always awesome. I used to often make braised whole trout with tomatoes and lemon; I have a saved recipe for braised salmon that I will probably make soon.